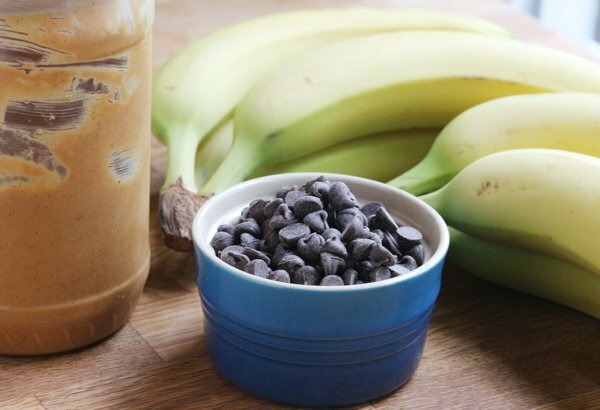 This frozen banana bites recipe will solve the big problem of summer. What is the big problem of summer? Ice cream. It is everywhere! In large amounts! I shouldn’t really call ice cream a problem because it is delicious and cold. But, I am surrounded my ice cream eaters and I need to cut back. This is easier than my peanut butter banana ice cream and more like dessert than my summer breakfast pop. This is a combination of a Reese’s Peanut Butter cup and a banana. I have been eating these instead of the Klondike Bars that my children love for their summer afternoon treat. I can’t imagine that this took me more than a few minutes to put together. 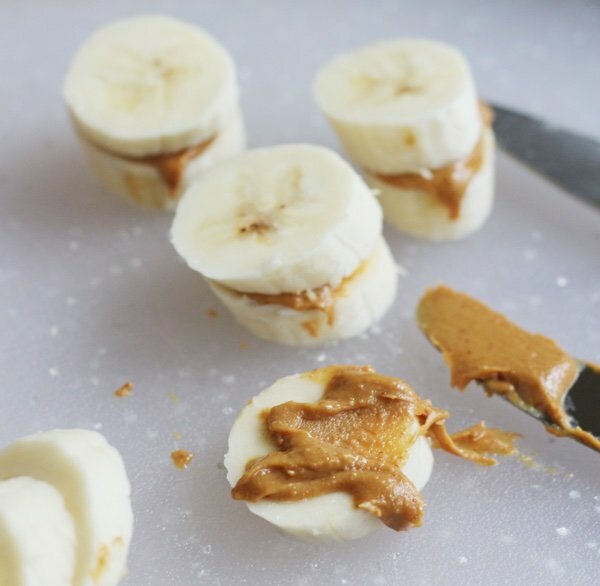 You can use whatever nut butter you have on hand (almond, cashew, sun butter) and simply spread as much as you like on the slices of banana. 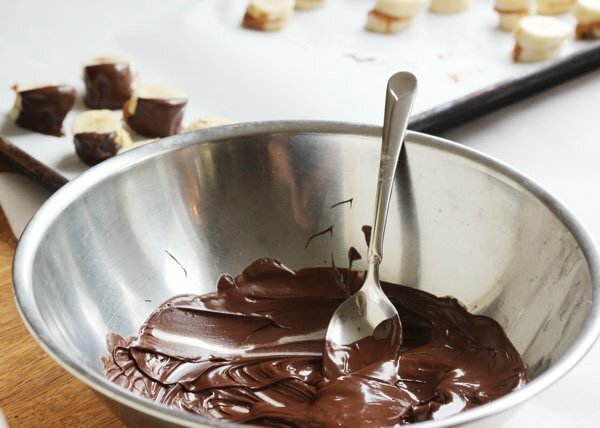 To keep the whole thing together before you dip it in chocolate, you need to freeze it for about 30 minutes. Then, you can use a double boiler method to melt the chocolate (or the microwave). I like to heat up a metal bowl with boiling water in a saucepan and then melt the chocolate. I find that I don’t overheat the chocolate this way (unlike the microwave where I have made a mess of things). After you dip the bites, put them back in the freezer for another half and hour and then store in a Ziploc bag or container. Do you know what happens? You make these to keep away from the oodles of ice cream and then your children see them and eat them!! No!! (actually, yess!!!!!). My kids think these are fun and don’t notice that they aren’t as sweet or as large as their usual ice cream treat. How do you replace ice cream when it is hot? Slice bananas into ½ inch slices. 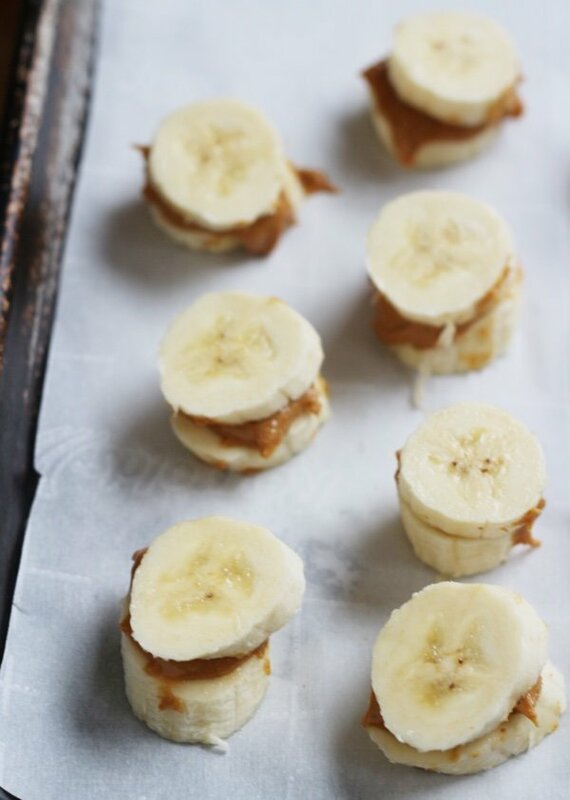 Spread nut butter on one half of slice and make banana sandwiches. Place on a cookie sheet covered in parchment or wax paper. Freeze for 30 minutes. Heat up chocolate until melted in a microwave with short bursts of power or a double boiler. 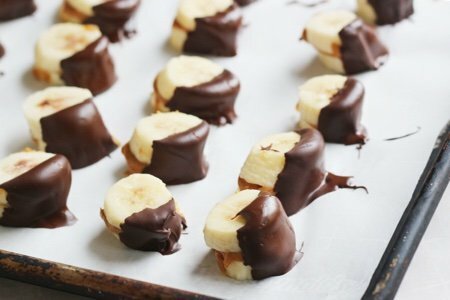 Dip bites into chocolate and put back on cookie sheet. Freeze for 30 minutes. Serve immediately or store for later consumption in a freezer bag or container. Are you hot? How would you like some steaming oatmeal? Yum! Yum! Yum! I WILL be trying this one out. Awesome idea. 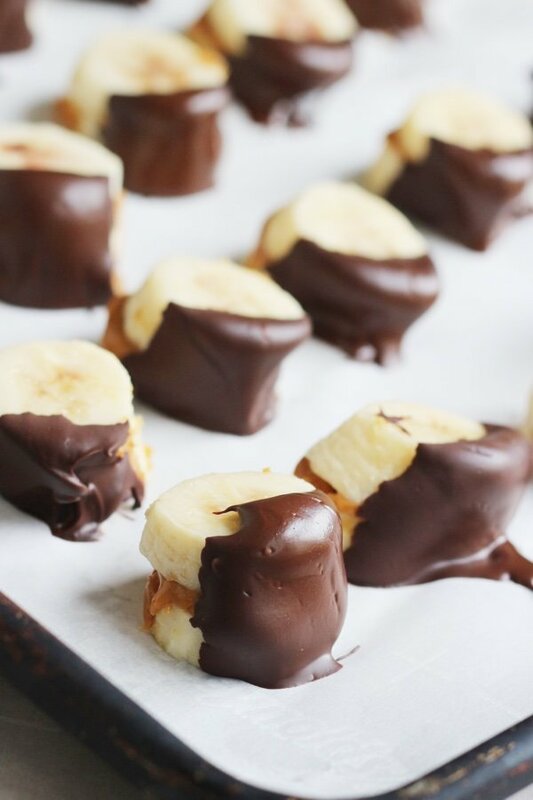 I've done just chocolate and banana before, but adding the peanut butter to these is a GREAT idea. Woo hoo! Oh boy, what a GREAT Idea....Yummy!!! i wonder if it will go down to 2 points per bite if I use PB2? HUGE hit with grandsons for taste. HUGE hit with me for taste, ease, and speediness. Thank you, Lisa! Lisa, these are so yummy and simple, a big hit with my vegan son and me. Thanks!